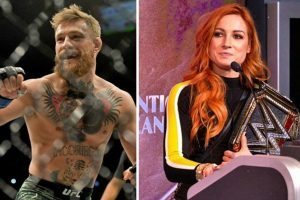 McGregor had been linked with making a surprise appearance at WrestleMania 35 last night with the UFC fighter in support of his Irish pal Becky Lynch. The Irishman failed to show up but did send a message of congratulation to Lynch after she clinched SmackDown and Raw Women’s titles in a spectator bout with Ronda Rousey and Charlotte Flair. The UFC fighter tweeted: “Congrats to Irelands Becky Lynch, the WWE’s first Champ Champ. Wow! “What a match these ladies put on! “Ronda Rousey is something special in that ring, as is Charlotte Flair of the Flair dynasty! “Stephanie McMahon you are right, I could not do what these athletes do. Lynch fuelled speculation of linking up with McGregor last November. She tweeted: “The Man channels no one. @TheNotoriousMMA & me are bonded as Irish brother & sister. And McGregor was quick to respond to The Man. McGregor’s UFC future appears in the dark with last month the 30-year-old taking to Twitter to announce his retirement fro mthe sport. The Irishman’s apparent retirement comes nearly three years after he hung up his gloves following a dispute with the UFC over promotional duties for UFC 200. But some UFC fans are unconvinced we’ve seen the last of him in the Octagon. In the meantime though, it seems McGregor is keen to play on chief brand officer of WWE Stephanie McMahon’s recent comments. Speaking ahead of WrestleMania, she said: “Who would I love to have in WWE? “I think, truly, the sky’s the limit and anybody who has a big personality. “I’d love to have Gronk [Rob Gronkowski] in the ring. I’d love to have Conor McGregor – huge personality. “There’s a number of different women I’ve had my eyes on as well.